Snapshot 14w07a Ready for Testing! IF YOU FIND BUGS, REPORT THEM, PLEASE! Now then, it's time for a new...Snapshot! ...okay, I'll stop that. So, what's on the menu for 14w07a? Please report any and all bugs you find in Minecraft to bugs.mojang.com. If nobody reports a bug, Mojang can’t fix it! 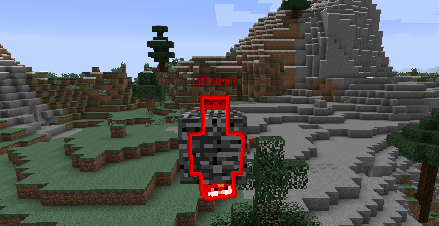 [Bug MC-47520] – Standing under block with water / lava on top will apply blue / red filter. This snapshot does not add much for survival, but I'm thinking the iron trapdoor can be really useful for adventure maps. Iron Trapdoors! The best thing in this update! I hope they add more stuff like this. But i think 1.8 is almost done. So... we can now have villagers trade you entire chests full of items now? Or give players pre-loaded command blocks? Or copy a region of blocks directly to a player's location? My mind is spinning with the possibilities here. I completely forgot about villagers here. Epic. So i've been playing Minecraft from the beginning.... I just learned the center mouse button was pick block because of this snap....can someone please slap me. It is an Trapdoor that can only be activated with redstone. Iron trapdoor is to trapdoor as iron door is to door. More like "Sweet changes for SethBling"
Finally stealth pvp has arrived with the nameTagVisibility! ALL UNITS ATTACK THAT SNAPSHOT!!! Has anyone noticed that torches are now tilted when on the side of a block instead of skewed? Yep, that's part of the new block models. gruhh another adventure map snapshot useful? kinda WE NEED FEATURES THAT ACTUALLY MATTER TO EVERYONE NOT JUST MAP MAKERS i do like the new trap doors BUT CATER TO EVERYONE WONT YOU MOJANG?? I think they need to add iron gates to match iron bar fencing. I don't understand the picture that always gets used for these "snapshot" posts. I am SO glad there's yet another snapshot aimed almost entirely at map makers instead of survival. OoooOOooOh, iron trap doors, that'll change single player survival a ton. Ok, seriously though, I hate when they insist on doing mapmaker only snapshots and things. For one, it's completely useless for me since I don't make maps, and usually don't play custom maps either. I play single player Survival, as I'm sure a LOT of people do, seeing as that's kind of Minecraft's main game mode. But yet update after update, they refuse to add anything remotely useful for survival. Survival needs big updates to keep it interesting, can we please start getting some of those updates? At least mix them in with the mapmaking features, so the snapshots aren't entirely useless to some of us. Also, I don't count a couple new biomes, some new flowers, colored glass, and a few new types of stone, to be very big for survival. It's all just aesthetic crap that we would be fine without. When I say survival needs updates, I mean proper game-changing updates. Survival's barely changed since they added The Ender Dragon, and even then, the only thing that changed was being able to go the the end and kill the dragon, then the rest of the game was the same as usual. Even the recent change to enchanting isn't a huge deal, it's not like it's going to change what I do in the game or anything. I'll simply just collect more lapis. It just seems Mojang forget that there's some people that play Minecraft, for the actual SURVIVAL aspect. The idea of having to survive, as you find and gather resources, to get better tools/weapons, to do more stuff. When you only update the game with aesthetic items, or mapmaker changes, you're leaving the group of people that play for proper survival mode, out with nothing. We need proper changes. Upgraded bows, more stuff in the nether, mini-bosses, more full bosses, more storage(chest) type blocks, more hostile mobs, daytime hostile mobs, more types of dungeons, more structures(above and below ground), more weapons, more enchantments, make the end useful for something after you beat the dragon, etc, etc. Remember that API they promised us? The reason so much of this is going in for mapmakers is it lays the groundwork for that API. Take a close look at what is possible now Vs. 1.6. Incredible things lay ahead, but we have to get there first! One of the behind the scenes feature makes it easier to add custom GUI's in mods. Another that was expanded in this snapshot gives better resource packs. Several annoying bugs from survival were fixed. I see more then just map making.